It's been over two years since the release of "'Til Death" and Daniel Graves finally returns with a new single "LAX", but like most Aesthetic Perfection releases this one also feels like a momentous move into somewhat uncharted territories and another shift for his musical amalgam of conventions. Off the Metropolis label and released independently, drenched in the neon glamour of pulsating blues and reds "LAX" arrives as an extension of Graves' ever evolving method into more approachable EDM rhythms, with the musician himself now a cross between the old goth persona and the new urban DJ- ready to once again take the naughty industrial kids out of their comfort zone and onto sweaty dance floors. The new track is immediately recognizable as a work of Aesthetic Perfection, its melody crisp and precise with vocals on the loud shrieking spectrum of Daniel's delivery. It opens with an instantaneous spring trap of well laid beats that propel the track forward and hook the listener in. 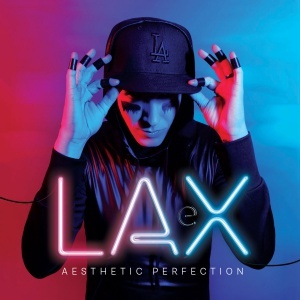 "LAX" is largely derivative of the AP of "All Beauty Destroyed" era but expertly realized, and immediately enjoyable. None of the accompanying remixes best the original but they do manage to pull it apart and reassemble in contrasting ways. Mr Kitty successfully injects his recognizable dreamy synth DNA into the songs' stream. By tapping into the inherent, pop backbone of most of AP's more recent work Kitty's Forrest Carney effortlessly makes "LAX" his own and while it's a predictable concoction it also interestingly broadens the appeal of the EP. "Kanga", from the ascetic and moody opening seconds, manages to transform "LAX" into a cacophony of revving guitars but in its often desolate industrial landscape they successfully encapsulate the beat and the emotive zest of Graves' style. Say what you will about the incendiary nature of the project's constant evolution towards the genre transcendence. Daniel Graves has been vocal about his lack of interest in your opinion on countless occasions but at least he continues to deliver the music for those fans that care to chart his changing approach to electronic templates, while constantly reaching out to the new listener, and only accidentally stumbling into the industrial playground. "LAX" is a solid piece of danceable electro that will surely resonate with DJs and audiences everywhere. It might be forgotten quickly but if this new EP driven mode of delivery is sustained a new, banging AP tune might be just around the corner.